Big and impressive, these CO2 powered confetti blasters deliver vast amounts of confetti very quickly and with a spectacular noise and a cold CO2 blast. We have two sizes of confetti blasters available for hire, our smaller Super-Blasters are great for most clubs and for TV studios where you want a large effect - between 3-5 kilos of confetti per minute - but don't need to throw confetti more than 10m. 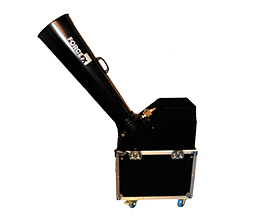 Our larger Mega-Blasters are real monsters and can throughput up to 10-15 kilos of confetti per minute with up to a 25m throw, so these are great for large dance events, Festivals or for Arena or Stadium events, but can be run at lower pressures when you don't need quite such a big effect. Remember though that these are a manual effect and need one technician per machine to operate them, they also use a lot of confetti which we can supply in bulk in almost any colour or shape.